Apache Spark is a powerful platform that provides users with new ways to store and make use of big data. In this course, get up to speed with Spark, and discover how to leverage this popular processing engine to deliver effective and comprehensive insights into your data. Instructor Shokat Ali provides an overview of the platform, going into the different components that make up Apache Spark. He shows how to analyze data in Spark using PySpark and Spark SQL, explores running machine learning algorithms using MLlib, demonstrates how to create a streaming analytics application using Spark Streaming, and more. In this course, we'll look at how to use the Apache Spark platform for data science. I'll start by showing you an overview of the platform and going through each component, so we have a baseline understanding of how it works. Then, we'll take a look at using Spark to analyze data with Python using PySpark, then using Spark SQL. We'll explore machine learning techniques,and we'll finish by creating a streaming analytics application using Spark Streaming. We'll be covering all of these topics to get you up to speed with Spark and help you start delivering effective and more comprehensive insights. Let's dive in. People with some software development background who want to learn the hottest technology in big data analysis will want to check this out. If you've never written a computer program or a script before, this course isn't for you - yet. I suggest starting with a Python course first, if programming is new to you. 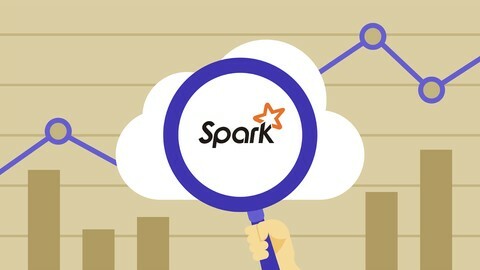 If you're training for a new career in data science or big data, Spark is an important part of it.